As can be seen, the #BTC Network Momentum is beginning to rise which may be indicating the transition from ‘early bear phase’ to ‘late bear phase.’ The next stage is ‘bull phase’ although that is likely still months away. — CoinDesk Markets (@CoinDeskMarkets) 5 грудня 2018 р. — Murad Mahmudov  (@MustStopMurad) 7 грудня 2018 р. — Murad Mahmudov  (@MustStopMurad) 25 липня 2018 р. #bitcoin halving: only 17 months to go! Is it already priced in? It certainly wasn’t in 2012 and 2016. — plan? (@100trillionUSD) 30 листопада 2018 р. 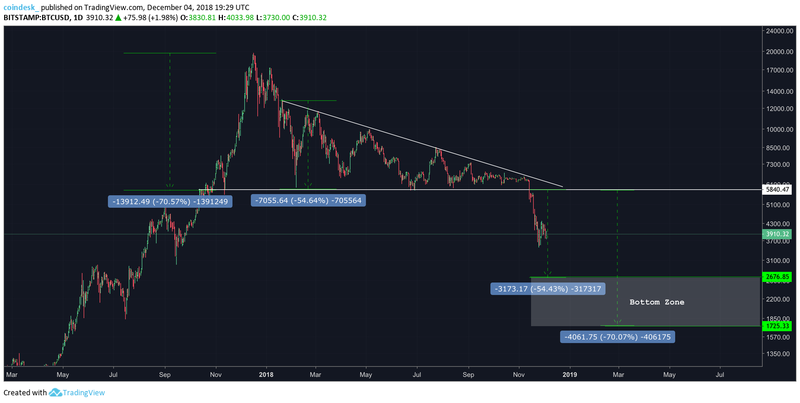 — Bitcoin Charts (no TA) (@ChartsBtc) 5 грудня 2018 р. — Peter Brandt (@PeterLBrandt) 30 листопада 2018 р. — Charlie Bilello (@charliebilello) 8 грудня 2018 р.